Southern In Law: SIL Sisters in Christ: What Does it Mean to Be a Godly Woman? Week Three! SIL Sisters in Christ: What Does it Mean to Be a Godly Woman? Week Three! Saint Augustine once said "It was pride that changed angels into devils; it is humility that makes men as angels" and I think the first part is certainly right. To be entirely honest, if you're truly a Christian you have to humble yourself. 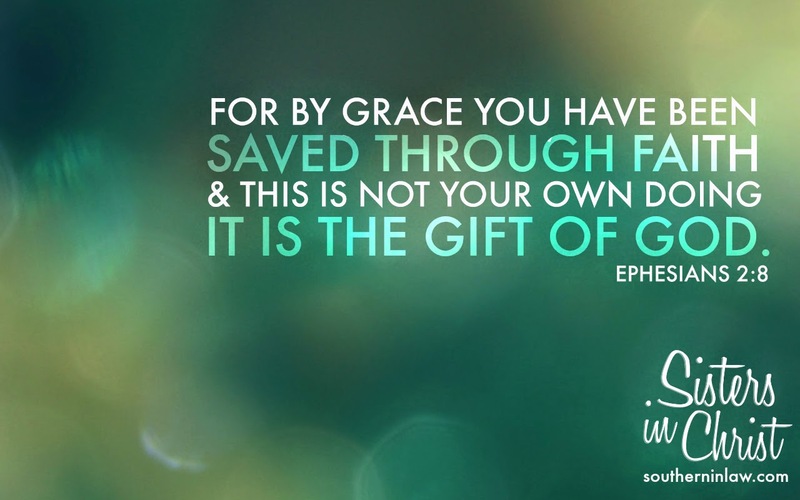 You are openly admitting the fact that you're not perfect and you can't be saved by what you do or how you act - as a Christian, you're saved not by works but by the grace of God who sent his son, Jesus Christ, to die for our sins so that we might gain His reward. What reward, you ask? Freedom. Free to love and be loved by our heavenly Father. "Has not my hand made all these things and so they came into being?" declared The Lord. 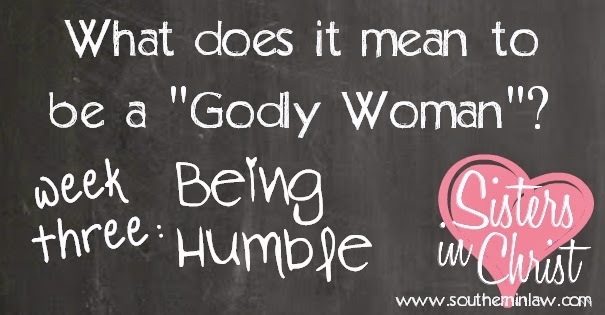 "These are the ones I look on with favour; those who are humble and contrite in spirit and who tremble at my word"
But, sisters, what does being humble mean to us? How do we do it and how far do we go? First off, I want to tell you this; being humble does not mean denying our self worth. For some reason, many people today feel that being humble means denying that you're worth anything whatsoever - but that's not true at all. Well, quite simply, a lot. Humility is a must for anyone who calls themself a Christian - the Bible states that over and over and over again. Jesus humbled Himself in a way I don't think many of us could even fathom. you to the interests of the others. - even death on a cross!" If we're taught that we should live as Christ Himself lived, humility is a huge part of that. Christ's life on earth began as humbly as can be - he was born as a tiny, fragile human baby in a stable in Bethlehem. The Son of God could have came to earth in whatever way he wanted - but God sent Him as a man. He could have pranced around like a rock star with golden robes and rhinestone slippers - yet he lived a simple life as a man. But more importantly, Jesus humbled himself to the will of his Father. Just look again at what it says in Philippians 2:8 "He humbled Himself and became obedient to death, even death on a cross". Christ is the ultimate example of a person being humble. And if the Son of God could be humble, why can't we?! But why is it so important in the Bible? Why is it so important for Christians? Humility is exactly what is needed to live in peace and harmony with all people. It allows us to dispel anger and heal old hurt. It allows us to see the dignity and worth of all of God's people - not just those we love. As servants of God, we must respect all of God's creation - and that includes our fellow human beings. Humbleness (or humility) is about being courteously respectful of those around you. Someone who is humble is not aggressive, arrogant, boastful or vain - it's the quality that lets us meet the needs and demands of others before our own needs. As a Christian, humility should come from the knowledge that God's creation is so much greater than our own little worlds. It's from being humble that we realise just how much we need God - and how much we need our saviour, Jesus Christ. How can we be more humble as Christians? The best way to humble ourselves before God is to give Him our time. This doesn't mean fitting God into your day - but building your day around the time you give to God. I know, I know - time is precious, but isn't your relationship with God more precious than anything?! By reading the Bible regularly and spending time in prayer you are already submitting yourself to the will of God. It's in these moments that you'll begin to understand God's plan for you - and when you follow God's plan and will, you're humbling yourself to our Lord and God. But how can we build our day around our time with God? I know - you have work/commitments/errands/a busy family/a schedule/routines etc - we all do! What we have to do is find what works for us. For me, my mornings are the best time to spend with God. It's when I can give my full attention and it totally starts my day off on the right note. I have to eat breakfast so after I've made Jesse and myself breakfast (and made Jesse lunch if it's a weekday), I take my breakfast into our office, sit in my big comfy chair with a cup of tea, my bible and my journal and I pray, read and write away. Then I head out on my morning walk, though I suppose you could call it a prayer walk as I spend my time walking praying to myself instead of listening to music. To the point where last week, instead of saying a cheery "Good Morning" to a man walking past me, I almost said "Amen". But don't just limit yourself to a certain time of the day - our day to day lives are different. You may find a certain time works for you three days a week but not the other four - it's all about being flexible. Most importantly, however? Don't compare yourself. I have heard so many Christian friends say "well I haven't been reading the bible because so-and-so reads the bible for 30 minutes a day and I'm lucky if I get 10 minutes so I don't have enough time". Whether you have five minutes or five hundred minutes, you need to spend that time with God.... do you really think He is counting? Would you not rather someone devoted some time to you than no time at all? But you cannot just humble ourselves before God - we need to humble ourselves in all aspects of our lives - especially when dealing with others. "Don't criticise, and then you won't be criticised. For others will treat you as you treat them. brother when you have a board in your own? even see because of the board in your own? Hypocrite! First get rid of the board. Then you can see to help your brother." No questions, just share your thoughts! You write like such a mature christian :) A very encouraging post that challenges how I prioritise my time. Hey Jill, I'm so glad this post was encouraging for you! I wouldn't call myself a mature Christian - just a girl who loves Jesus and can't get enough of the bible! Hey sweet friend! I am so glad this post came at the right time for you - there is nothing better than a good a-ha moment! Even just a moment of time spend with Our Father each day changes our entire life - and allows us to love others more! I used to find it hard to give up time when Jesse was around but I realised it actually benefited Jesse far more than sitting and watching tv with Him as I was becoming the wife God intended me to be! It's all about His love and loving others in the way He intended! So many things you said resonated with me! When I build my day around God, as opposed to fitting him in like an afterthought, I am a better wife, mother, and friend. This quote is especially important, "Humbleness (or humility) is about being courteously respectful of those around you. Someone who is humble is not aggressive, arrogant, boastful or vain - it's the quality that lets us meet the needs and demands of others before our own needs." Such an excellent reminder dripping with truth! I am so glad the post resonated with you! We are so much better off when we build our day around God!